Sami Khedira scored the first hat-trick of his career as 10-man Juventus beat Udinese in a high-scoring Serie A game. Stipe Perica gave Udinese a shock lead, but Samir's own goal levelled before 30-year-old Khedira headed Juve ahead. 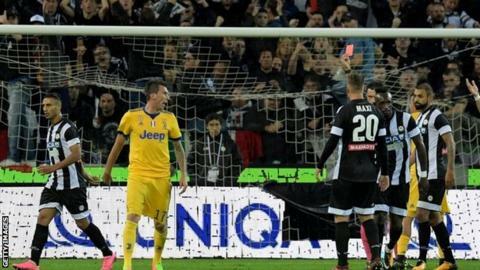 Mario Mandzukic was sent off as he was shown an instant second yellow card for appealing against a first booking. Danilo levelled, before Daniele Rugani put Juve ahead again and Khedira scored twice to complete a hat-trick before Miralem Pjanic's last-minute strike. Juve are within three points of leaders Napoli, who dropped points for the first time this season on Saturday when they drew 0-0 with second-placed Inter Milan. Earlier on Sunday, former Juventus defender Leonardo Bonucci was sent off for AC Milan against Genoa, meaning he is likely to miss next weekend's meeting with his old club. Match ends, Udinese 2, Juventus 6. Second Half ends, Udinese 2, Juventus 6. Goal! Udinese 2, Juventus 6. Miralem Pjanic (Juventus) right footed shot from outside the box to the centre of the goal. Assisted by Alex Sandro. Substitution, Juventus. Federico Bernardeschi replaces Stephan Lichtsteiner. Goal! Udinese 2, Juventus 5. Sami Khedira (Juventus) right footed shot from the right side of the box to the bottom left corner. Assisted by Gonzalo Higuaín. Attempt missed. Maxi López (Udinese) right footed shot from outside the box is close, but misses to the left. Assisted by Rijad Bajic. Substitution, Udinese. Rijad Bajic replaces Stipe Perica. Rodrigo de Paul (Udinese) wins a free kick on the right wing. Attempt missed. Seko Fofana (Udinese) left footed shot from outside the box is high and wide to the left. Substitution, Udinese. Jens Stryger Larsen replaces Ali Adnan. Corner, Juventus. Conceded by Ali Adnan. Substitution, Juventus. Douglas Costa replaces Paulo Dybala. Substitution, Udinese. Giuseppe Pezzella replaces Samir. Ali Adnan (Udinese) wins a free kick in the defensive half. Offside, Juventus. Sami Khedira tries a through ball, but Gonzalo Higuaín is caught offside. Attempt missed. Maxi López (Udinese) header from the centre of the box misses to the left. Assisted by Rodrigo de Paul with a cross. Juan Cuadrado (Juventus) is shown the yellow card. Samir (Udinese) wins a free kick in the attacking half. Goal! Udinese 2, Juventus 4. Sami Khedira (Juventus) right footed shot from the centre of the box to the centre of the goal. Assisted by Daniele Rugani with a headed pass following a set piece situation. Emil Hallfredsson (Udinese) is shown the yellow card for a bad foul. Foul by Emil Hallfredsson (Udinese). Attempt blocked. Miralem Pjanic (Juventus) right footed shot from a difficult angle and long range on the left is blocked.